One of the great features of our Smarter WordPress hosting product is the ability to simply clone and sync between a staging version of your site. This allows you to do things like quickly test a new theme or plugin you may be wanting to use and see if it causes any issues you may have to fix up first or even reconstruct part/all of your site without interrupting access to the current pages. Now that you are logged into Plesk select the ‘Clone’ option next to the provided quick actions for your WordPress site. The page presented will show what’s going to happen, Essentially that it’s going to take your existing site that’s installed and make a new copy of the files and database under a new subdomain. By default this will be called “staging.YOURDOMAIN.COM” however you can select the name given and change it if you wish. 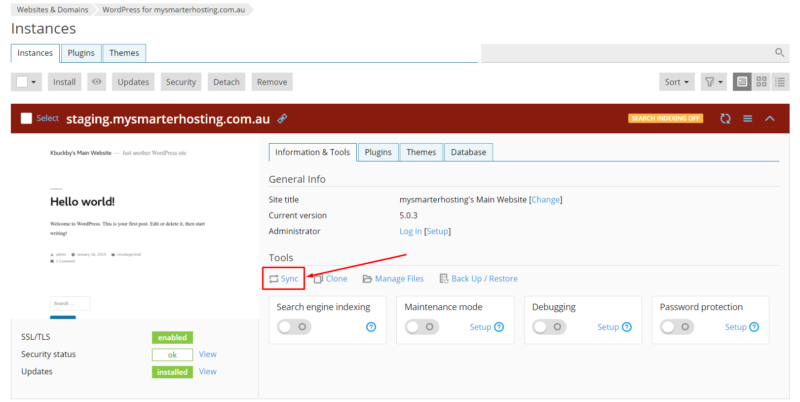 Once you press OK it will take a moment to do the copying and creating the new subdomain, Once finished it will load to an overview of your WordPress sites and give you options to manage them. Your cloned site will be headlined with the name you gave it (staging.YOURDOMAIN.COM by default) and it will have things like search indexing turned OFF as you wouldn’t want people to stumble upon it by mistake when looking for your actual site. You just need to type in the domain for your main site in the box given and select that. Leave all other options below this as they are set and select “Ok” to proceed. This will offer to create you a restore point in case anything goes wrong – We suggest leaving this enabled. Once you accept that prompt the site will be copied across and all going well you should now have any changes made on the staging site live on the actual website.